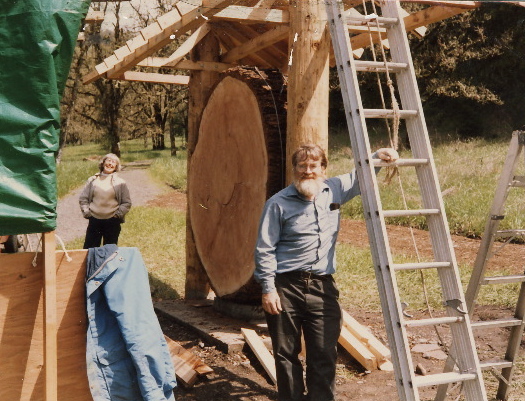 1986, April. 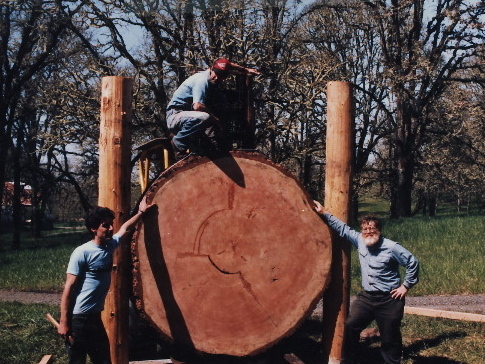 Tom LoCascio, Paul L.Patterson, III and Theodore W. Palmer placing the one ton, 7 foot diameter, 451 year old Douglas fir tree round between its two support poles. MPA did not yet own ANY power equipment. We borrowed a loader which is almost hidden in back. This picture was taken by a passerby just after we had secured the tree-round with two 18 by 3/4 inch lag bolts through the poles. Earlier, I had chained the poles to a corner of the bed of Tom’s dump truck. When I lifted the bed the poles dropped into the holes I had dug and I refilled with loose gravel.